The character of any wine results from thousands of decisions over the course of a vintage. In the vineyard, those include how to prune and train the vines, which leaves to pull, whether to drop fruit, not to mention if, when, and and how much to irrigate. In the winery, there are choices about grape handling, yeasts and additions, vessels for fermenting and aging, how much sulfur to add and when. Even choosing not to do something on a given day is a decision. Of all the decisions made for a wine though, when to harvest is arguably the most significant choice. It affects yield, flavors and aromas, texture, acidity, potential alcohol, balance, approachability, and aging potential. One or two days can make a huge difference. And waiting too long can result in substantial losses if the weather turns bad. The decision of when to pick is usually made by the winemaker. Sometimes, the grower or vineyard manager decides, particularly when fruit is being sourced from an vineyard not owned by the winery. But how do they choose the date? Some criteria are related to grape ripeness. Others are logistical. Usually, a combination of both drives the decision. 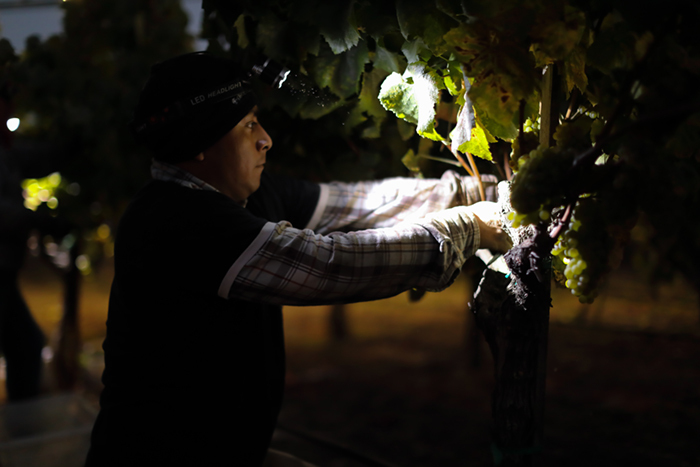 Harvesting at night captures grapes with higher acidity and lower sugar than during the day. The fruit is also cold, which saves all the electricity which would be needed to bring it down to temperature through refrigeration. Photo by Jon McPherson for Napa Valley Vintners. Availability of pickers and/or sorting crew: Few wineries have enough of their own staff to get all the fruit in quickly. They rely on crews which harvest many other vineyards. Thus, scheduling is a often factor.. That said, very small vineyards, and those with multiple varieties which ripen at different times, may be able to do harvest themselves. 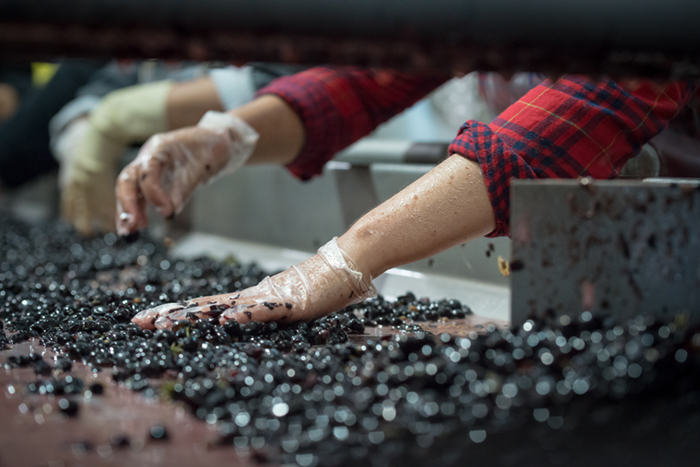 Available space at the winery: When grapes come in, they need to go into vessels for cold soak or fermentation. Sometimes, there’s so much fruit coming in that wineries run out of places to put it. Some wineries rent tanks or bins. But others need to delay further picking until on-going fermentations are complete, making those vessels available. Available transport: Most wineries don’t have their own trucks for transporting the harvested grapes. They need to hire a company to do that. If the grapes need to go a long way, a refrigerated truck may be necessary. Weather: Grapes may need to be picked sooner than might otherwise be desired to avoid potential damage from an upcoming storm. On the other hand, harvest may be delayed for a few days after a rain, allowing the grapes to lose some of the excess water they sucked up. The status of different varieties or vineyards: A winemaker may choose to let some fruit, deemed less sensitive to harvest date, hang a few days longer in order to deal with other grapes which absolutely must be picked right away. This urgency is typically due to either state of ripeness or disease pressure. Sugar level: For many years, the amount of sugar in grapes’ juice has been a key factor for winemakers harvest decisions. Sugar content is by far the main determinant of the amount alcohol in a finished wine. Sugar content is also easy to measure while in the vineyard, using a refractometer. And, since sugar levels steadily increase as grapes ripen, winemakers can use those levels as a general guide to the grapes overall readiness. However, sugar level isn’t a precise indicator of ripeness. Sugar levels may run ahead of phenolic ripeness (flavor, color and tannin) if the weather has been very hot and the grapes are dehydrated. Sugar levels may temporarily run behind phenolic ripeness, if there’s been a lot of rain and the grapes are full of water. And sugar doesn’t at all indicate what the grapes actually taste like. Acidity: While sugar rises with ripeness, malic acid declines. A certain amount of malic acid—along with other acids present in grapes but which decline much less over time—can be important to balanced, juicy wine. Too much acidity makes the wine excessively tart or even sour. Winemakers look for sugar and acidity that are harmonious in the grape and appropriate to both the variety and style of wine. Acidity can be measured precisely in a lab or estimated by eating the grapes. Flavor development: The flavors in grapes don’t exactly mirror those of the wine they will make. However, the character of the grapes' flavors do reflect the general character of the wine: ripe, underripe, cooked, tart. Winemakers want delicious grapes which feature the best character for variety, site and style of wine. Tannic development: Most tannins in wine come from the grape skins. Chewing on the grapes, and testing them in a lab, reveals tannic development. Are the tannins soft and harmonious or astringent and firm? Character of the seeds: Both flavors and tannins from grape seeds can find their way into wine, especially in red wines which ferment together with the grape solids. Underripe seeds taste green and are very astringent. Mature seeds are dry, crunchy, not astringent, making them less likely to contribute harshness to the wine. Potential for further ripening: Late in the growing season, temperatures cool and there are fewer hours of daylight. More frequent clouds can also limit sunlight. At a certain point, there isn’t enough daily heat and sunlight to ripen grapes much more. Then the risk losing bunches due to bad weather or disease outweighs the potential benefit of further hang time. Date and time of harvest is probably the most significant of all decisions made by a winery for any particular wine. It's a complex calculation. The criteria above include many, but certainly not all, of the factors which must be considered. These variables also show why picking earlier to make wine with lower alcohol may not be a good course of action. In places such as Napa Valley, where the weather is great most every year, high-end wineries are usually able to pick according their style preference. Some produce ripe, full-bodied wines while others prefer wines with more savory characteristics. JJ Buckley offers plenty of each style for you to compare and enjoy. Here are some examples.